Hibs boss Alan Stubbs has revealed he’s still hoping sign a new defender despite having lost out on both Lewis Toshney and Paul Quinn. Former Celtic youngster Toshney and ex-Motherwell star Quinn enjoyed trials with the Easter Road club, with Stubbs admitting that David Gray’s right-back berth was the only position lacking cover. However, the head coach was left disappointed as first Toshney then Quinn opted to join Premiership outfit Ross County. Stubbs’ need to add to his squad was highlighted as he began derby week with just four fit defenders and only one recognised centre-half, with Jordon Forster ruled out for six weeks with a broken foot and Liam Fontaine battling a thigh problem. Callum Booth joined Paul Hanlon in central defence for the 4-0 demolition of Livingston as Hibs made it five games without defeat ahead of the visit of Capital rivals and Championship leaders Hearts, and although he has hopes that Fontaine will be fit for Sunday’s clash, Stubbs still has eyes on making a tenth signing. The transfer window shut long ago, but players who remain free agents can sign for a club. Stubbs said: “The best way to describe it is to say we are active. We are looking to see the availability of certain players and to see what we can do. Although he’d have liked to have added to his squad, Stubbs insisted there’s already plenty of competition for places among those at Easter Road. “I’ve said all along I don’t just want 11 players who are the starting line-up and the rest knowing they do not have a chance of playing,” he said. 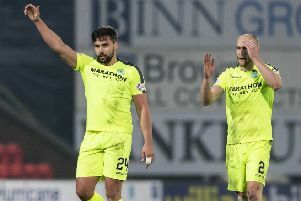 Hibs go into the derby buoyed not only by their unbeaten run but by those four goals against Livingston as they showed the ruthlessness in front of goal which Stubbs had been looking to accompany what he believes have been promising performances. But while Hibs trail Robbie Neilson’s side by 14 points, Stubbs insisted he’s not concerned, saying: “It’s that old cliché of taking it one game at a time, of not looking any further than the next match and seeing where it takes us.